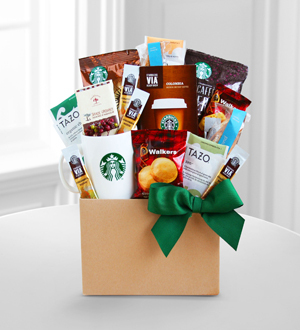 Harvest time means crisp days and chilly nights - a perfect time for a gift of Starbucks coffee and sweet treats. This natural kraft tray is a special way to show your gratitude to family and friends. It holds two bags with assorted roasts of Starbucks coffee, Starbucks VIA coffee, a ceramic Starbucks logo mug, assorted Tazo teas, crunchy Starbucks biscotti, three bars of creamy milk chocolate and Walkers shortbread cookies. They will love it!